A few years ago my game had gone to hell and I was at the end of my rope. Brent, “The Golf Whisperer” took me under his wing and taught me one drill that changed my game forever. I was swinging way too hard and fast to let the golf swing unfold properly. So hard in fact that I had been blamed for several earthquakes in the area when I would take a divot. It was so bad my friend Richard used to crack up and how hard I swung and how high the ball went. Not good. Joking aside, I was off balance during my backswing and downswing. This led to me trying to control the clubhead instead of letting it follow its natural path. Bad shots… inconsistency.. frustration. 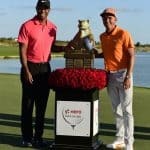 The Golf Whisperer told me that perfecting balance is perhaps the true secret to mastering consistency and developing a repeating swing. Swinging in balance gives you tempo. Tempo equals better consistency. … I don’t care what swing method you use, you need to maintain your balance when applying force to the back of the ball if you want a good result. Lose your balance, even just one tiny bit, and all bets are off… you just can’t develop any kind of consistency or power generation being off balance. 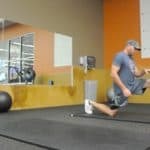 The simple fact is, you need to maintain a stable and dynamic platform that can harness all of the strength you have developed using my golf fitness workouts. Fortunately, the workouts I design will give you the strength and coordination to maintain a dynamic motion such as the golf swing. …and when my shots start to stray, I go to this drill IMMEDIATELY. The feet together drill programs your swing so everything unfold naturally, in sequence. Why do the feet together drill? Promote good balance and rhythm. Improve timing, reduce swaying, and promote good swing mechanics. Provide a quick check of good swing mechanics (used regularly). How to perform the feet together drill. 1. Grab a 7-iron and place your feet together. Swing at a smooth tempo and rhythm. If you swing too hard here, you will definitely fall on your face! 2. Swing slowly at first. Concentrate on tempo and swing slowly. Hit 20 balls in a row until you start making consistently good shots. You can even use a half swing at first to get the hang of it. feels when you hit a perfect shot. 3. You might be surprised how far you actually hit the ball once you develop a smooth tempo. My feet together shots when struck perfectly go about 90% the distance of my regular stance shots. I even joked with the Golf Whisperer about playing full rounds with my feet together. 4. Re-create this SAME EXACT tempo and rhythm with your full golf swing. If you don’t achieve the same result, back off and go back to the drill. I recommend going a step further once you have mastered this drill with your low irons.. Start moving up iron by iron until you can actually hit your driver. Here’s a quick video I filmed with Rich on the feet together drill and also the swing as a whole and why this drill is the holy grail to dropping your score. 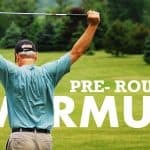 Remember, the golf swing must unfold in sequence if you want any type of consistency. Swinging too hard and too fast rushes things and puts the cart in front of the horse. 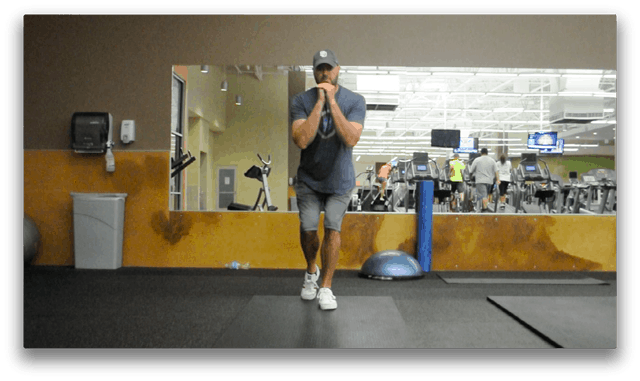 Drop this superset in at the beginning or end of your current workout. I prefer to work on balance first thing when my body and mind are fresh. The following superset combines two forms of ‘balance’. I use the term balance loosely.. but let me explain how I view balance when it comes to fitness and applying our workouts to the golf swing. Golf is a one sided sport. You play right handed or left handed. Just as our golf ball can be lop-sided, so too can our body. It is crucial that we work both sides of the body and bring it in balance. Even getting out of the golf cart on the same side every day can cause an imbalance that can affect your low back and game. What most people to consider ‘balance’ when talking about fitness exercises. In fact, it’s really only half of the balance equation. I don’t want to cloud a very basic concept with medical jargon.. so I created my own definition below based on the medical version. Sense of body motion. Coordination. Ability to balance yourself in an unstable environment (golf swing). The following superset combines balance (proprioception) with balance (symmetry). If one side of our body is stronger than the other, it makes it more difficult to maintain your equilibrium. 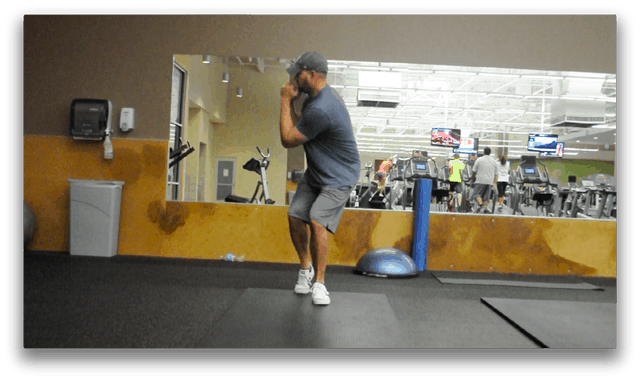 I randomly pulled out 3 balance exercises from my newest Golf Fitness Workout System – Core to Score for you. Perform the following circuit with no rest between exercises. Rest 1 minute after completing the circuit. Repeat the circuit two more times for a total of three times. You may use dumbbells. If you choose to use dumbbells, choose a proper weight you can handle without hurting yourself. You want perfect form, not sloppiness here. Pick a weight you can handle for the allotted time. Rest 1 minute and repeat two more times. Stand upright and place your body in a proper address position, knees slightly bent, fixed spine angle, and arms crossed over your chest. Raise the right foot slightly off the floor while maintaining your address position and fixed spine angle. It’s ok to lightly touch the ground with your right foot. As you progress, try holding it without touching the ground. Begin to slowly rotate your shoulders to the right to the point of a complete shoulder turn. Return to the starting position of the exercise and repeat. Repeat the exercise balancing on the left foot. That was a long article, but one I hope you find useful. P.S. Leave me a comment and let me know what you think of this article!